Using perennials for containers is a great way to save money and keep the plants in the ground happy and healthy. Today I’m back with the wonderful group of gardening bloggers from Tuesdays in the Garden. We will be sharing a new gardening topic, on the 2nd Tuesday of the month, from now until September. 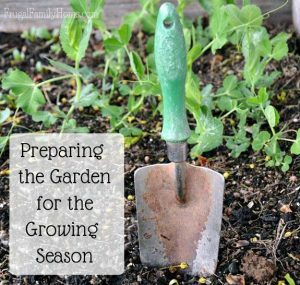 Today’s theme is all about things we like to accomplish in the garden at the beginning of the season. Outside of pruning and tool maintenance, one of the first things I do in the spring is look at dividing my perennials. Then as the weather warms up I buy tons of annuals for all of my planters. However a couple of years ago I got really busy and didn’t have time to buy all the annuals that I usually do. In addition, I had more than enough perennials which really needed to be divided, and not a lot of places for them to go. So, I ended up using them in some of my containers and I’m so glad I did. Above is a photo of some of my mini hosta in early spring. They had no trouble growing after a long winter. This is the same hosta in bloom during the summer. See how it grew well into the sidewalk. I kind of like this look, but it goes to show you that taking a few divisions for pots is not big deal. There’s plenty to go around. Here’s a photo of growth at the beginning of the season. The plant in the back is a penstemon, and the front is the mini lime green hosta. This is a great time to divide most perennials whether they are in the ground or in pots. This is especially true for hosta, because you can easily see where to make a cutting. Once they fill in it becomes a little harder to separate the plant. If you have any Geranium sanguineum in your garden, they you probably have many volunteers as it spreads readily. Why not move some of them to containers? Lamium is another cold hardy perennial. It’s ground cover that looks beautiful trailing out of pots. This one is ‘Orchid Frost,’ and works great in a shady spot. In late fall or early winter, move the pots close to the house, a shed, or garage, for extra protection during the winter. If you’re not using perennials from your own garden make sure they will thrive in your area. You can refer to the USDA zone guide to determine your zone before you buy a new plant. Most plant labels the plant’s hardiness zone. Here are few suggestions that work in my Zone 6a garden. The spring is a great time to divide perennials. This helps avoid disease from over crowding, and ensures bigger and more productive blooms, so why not take advantage and consider using perennials for containers? It will help you save money, because you will have less annuals to buy. The rest you can relocate or give away to friends and family. Thank you for the tips. How do you winter over the plants in pots that are not huge and better insulated? Do you move them out in Fall? Good question Mary. I move some of my pots unto our patio near the house in the late fall. I think it helps protect them some. I really appreciate your ideas and advice. Keep them coming. I look forward to seeing and reading them. When it comes perinals garding and flowers I have no restrictions. Love love it! Glad to hear it Joyce. Welcome! I love this idea so much, Patti, and am so inspired seeing your pots filling on their own in the spring instead of having to buy a ton of perennials! I’ve done a little of this, but am totally going to think more perennials with annual fillers for the future – thank you! I’m so glad you like this idea Jami. A real time saver and I have no idea why it took me so long to try it out. What a timely post! I have a perennial bed I need to get rid of. I can’t keep up with it all as I’ve gotten older. This is a great way to keep some of my favorite plants! And of course, I already have plenty of extra pots to put them in. I’m so glad you liked it Jenny. It’s funny that I’ve just started doing this myself after many years of gardening. And, I’m thinking a pot of a pretty perennial might make a nice gift for someone who doesn’t really like to dig in the garden and/or maybe has a small area to enjoy. I have a few hostas that need to be divided. But I’m afraid I’ve missed the opportunity for this year since they are already opening up their leaves. I’ll have to try in the fall. Time got away from me this year. I love how you use perennials to fill in your containers. I need to give it a too. Such a great idea, Patti! In my experience Shelly hosta can be divided at any time. It’s just a little harder when they fill in and you might cut off a part, but hey, they are super survival plants and will bounce right back. I need SHADE LOVING preinals and pictures if possible advice. I’m disabled have a little space outside my apt.snd so desperate to give God beauty and then me. I need the pictures because I have a hard time remembering what it should look like. Can you help? Thanks. The planter in the post has all shade loving plants in it. The mini hostas shown here are perfect for the shade, as is the penstemon in the back. How about lily of the valley? They smell wonderful but the blooms are short lived. A lot of perennial geraniums do well in the shade too, especially big root geranium or Geranium macrorrhizum. Ok NOW I’m getting out there and dividing my poor hostas. The weather is perfect for it and they are so overgrown. I’m always excited this time of year to get my containers planted. I have a few with perennials in them. Some of those will winter over in our milder winters. Love this inspiring post. Thanks for the tips! I’m so glad you liked it Diane. Hosta just seems to grow and grow and grow, doesn’t it? It really does look nice in containers. My only problem is finding somewhat shady areas for it because sometimes I get burn out from an area that is too sunny. Thanks Michelle. I get wayward volunteers all the time. Some I also really like. There’s one little weed I sometimes get that looks like a pretty fern. I usually leave it there unless it gets too big. Great ideas Patti – Missing some of my flower perennials from the farm but my herbs have filled the void. Love the foliage form the Lamium and the thing I like about putting some perennials in containers is seeing the trailing transpire, it adds character to the presentation. I totally agree Carole. Vines and ground covers look beautiful in containers when they trail over the sides. I love growing vines in containers on a trellis. Great for a different use of plants in the “thriller ” category.